I had heard that there was 3-6 inches of snow in the forecast, but I was cynical. We often have early snow forecasts that don’t pan out. But wouldn’t you know it, as I was leaving work there were big, wet snowflakes falling. 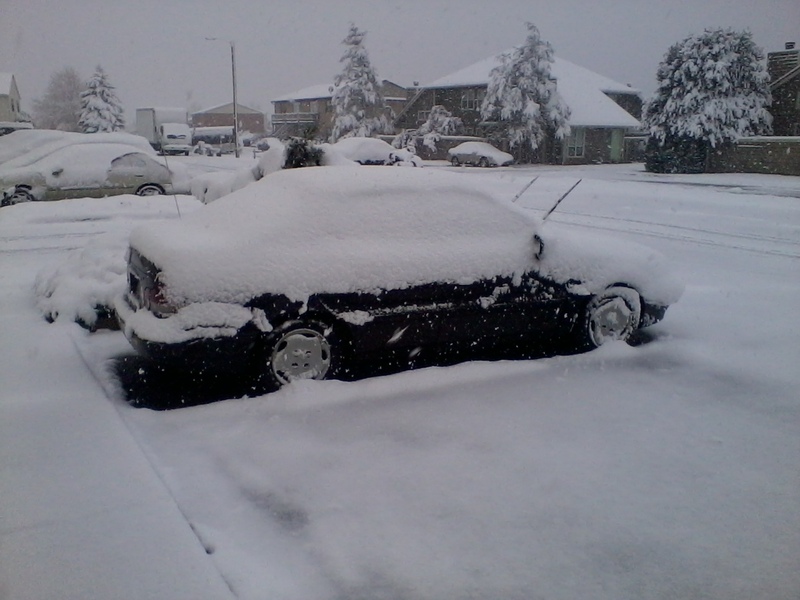 The next morning we woke up to about 4 inches on the ground. I stand corrected. I don’t think I’ve ever had to break out the warm gear so early in the year. I usually can make it with a fleece until after Thanksgiving, and sometimes almost to Christmas! 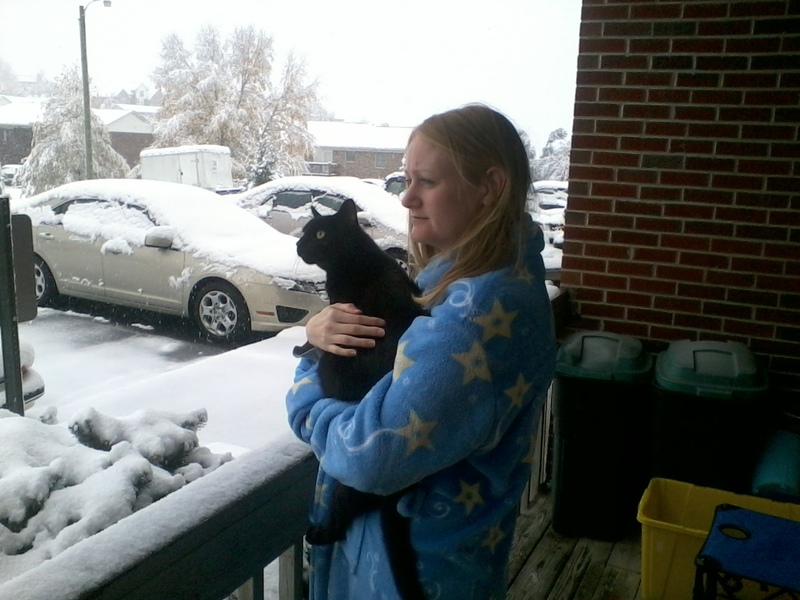 Melissa showed Oliver the snow. 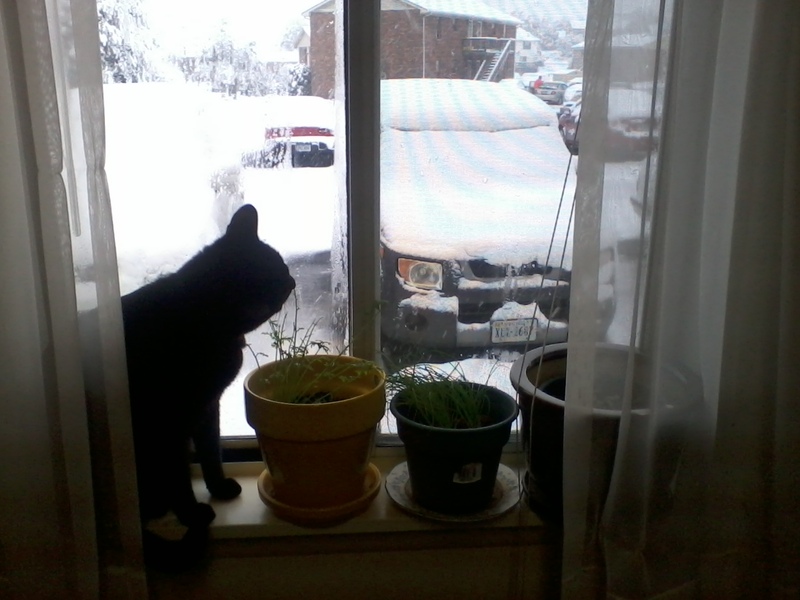 He was interested, and hopped up on the windowsill for a better look. 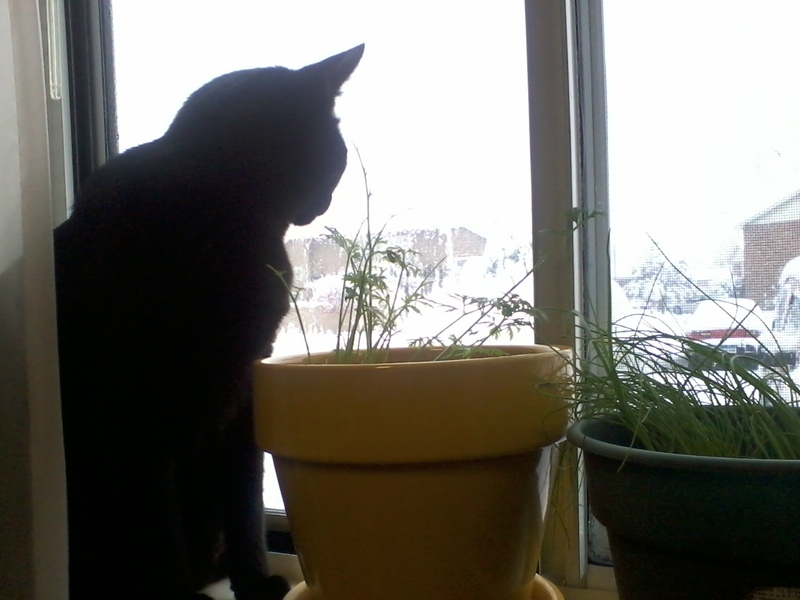 He was then promptly distracted by the plants. We were heading out on the town to re-stock on some much needed consumables (TP, shampoo, shaving cream, library books and dvd’s, etc. 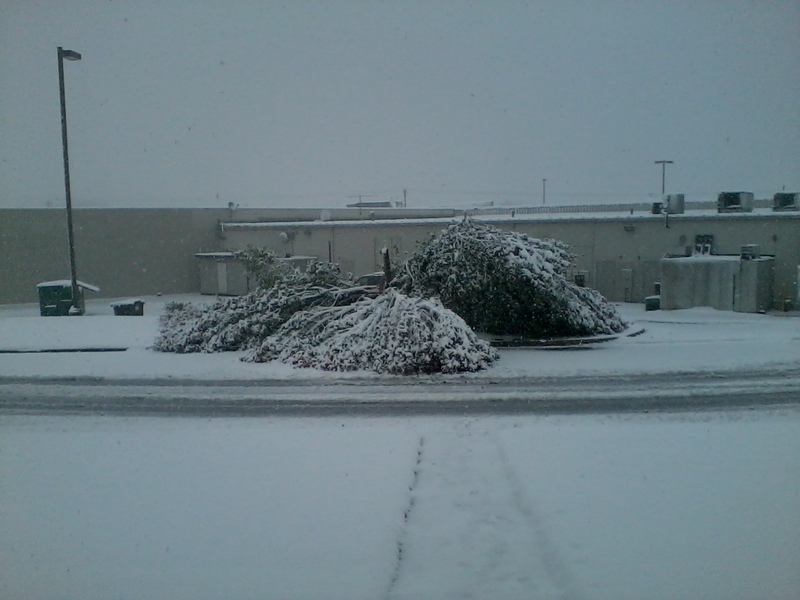 ), but first had to clear off the car and avoid the tree carnage. This particular tree was across the street, and feel into the road blocking one lane. I should note that we would have loved to get up in the mountains and explore the snow, but I had to work…which is why all the pictures were taken around our apartment. 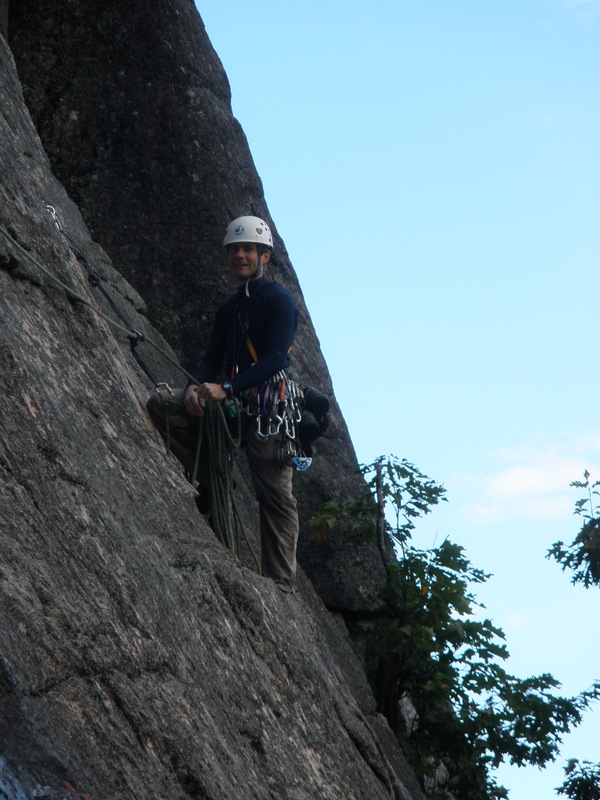 I spent a day patrolling on Old Rag today with Old Rag Mountain Stewards (ORMS). I’m used to hiking Old Rag in the off season, so hiking on the mountain at the height of the fall foliage season was a bit new for me. The weather was beautiful. Mid 60’s, with blue, sunny skies and a light breeze on the summit. There were scads of people, though I was told that there were more yesterday. I’ve never had to wait to get through some of the constrictions on the trail before, but there is a first time for everything and today was that day. I spent about 15 minutes waiting at one place, and another hour policing the area around The Chute. One gentleman was so grateful for the advice and support of the stewards that he donated $20 to the ORMS cause. 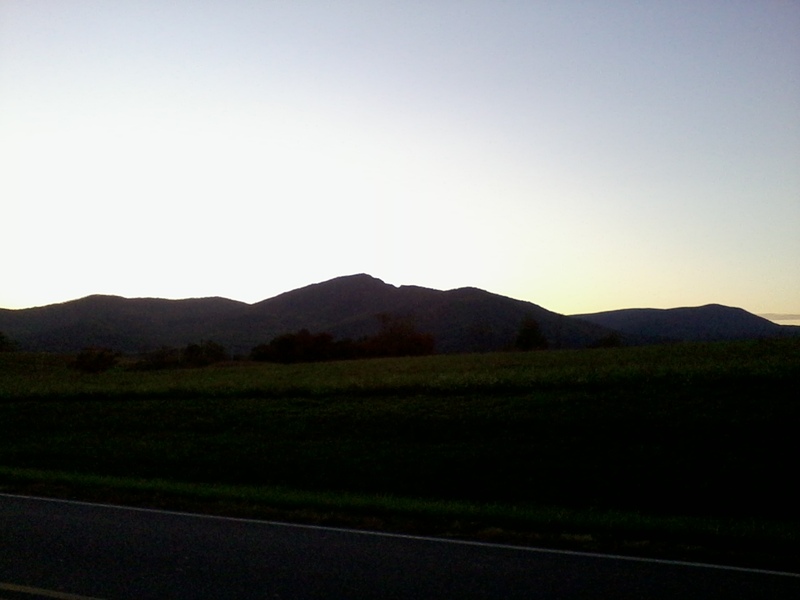 I had a great time though with the other stewards, and though I wasn’t able to get any photos while on the mountain itself, I was able to use my camera to get this cool picture of Old Rag from the main road. 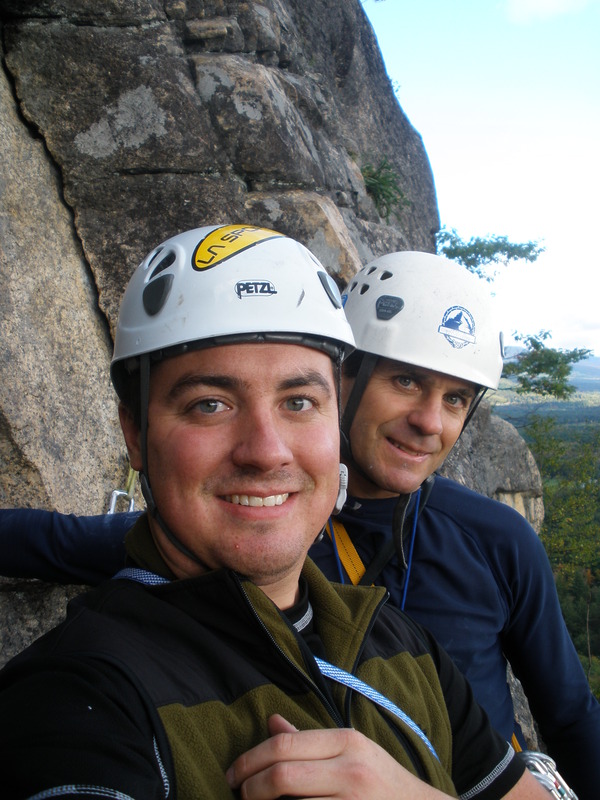 We actually had two cameras on our day at Cathedral Ledge. You’ve seen my photos already. Here are some photos Dad took. They were taken with a disposable camera, so the resolution is a bit lower. Done with the first pitch! That was the sketchiest section of 5.6 traverse I've ever been on. This was a fun flake to work up. You can see the water just above me. I called this gully "The Womb." First, I apologize for being gone for so long. I’ve been grabbing at every extra shift I can get at work lately, and this typically means that I can’t blog like I used to. I’ve also discovered that my old proclivity for being rained out is still in full force. I was planning on going and grabbing an hour or so of climbing before work today. I woke up at 6:30 to find it raining torrentially outside. This continued until about 1PM or so, and it is currently misting. Just as well after all; turns out I had work at 8AM instead of at 11:15AM like I thought I did. I’ve also recently had an idea; as some of you know, my Dad owns Wild GUYde Adventures, and I occasionally work for him. 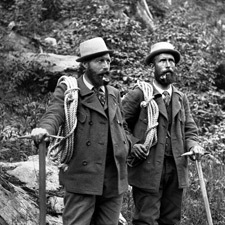 I’ve decided it would be an interesting promo if we did a few trips dressed as historic Swiss mountain guides. I can see it now! I did, however, just return from New England. 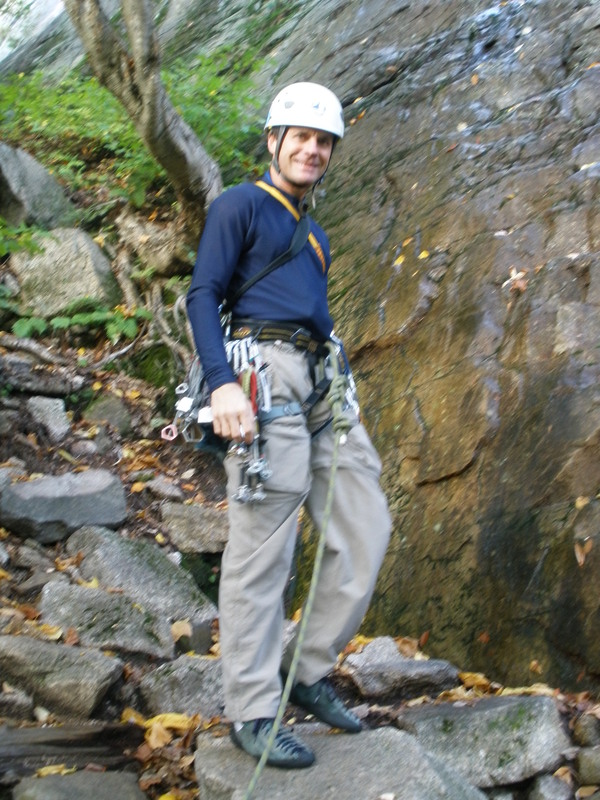 I was given the opportunity to travel to Boston with my Dad to attend the 2011 Wilderness Risk Management Conference. If you’d like to read more about what I learned there, head on over to Mountain Rescue Blog, and read some of my epiphanies. 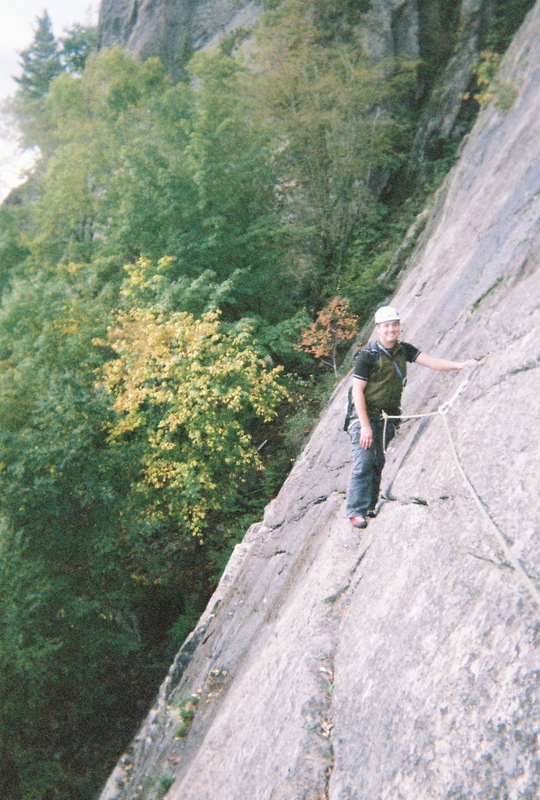 What I’m going to write about here was the fantastic day of climbing my dad and I had in New Hampshire the day before the conference. 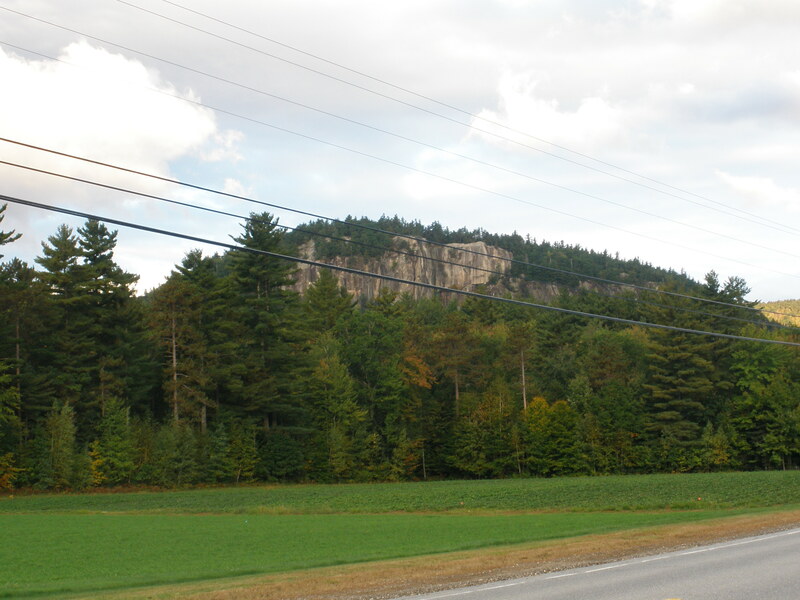 We traveled to North Conway, NH and spent a day climbing at Cathedral Ledge, right at the edge of the White Mountains National Forest. We thought we were going to get rained out (it rained during the entire drive from Boston to North Conway). We decided to take a crack at Thin Air, 5.6/5 pitches. After scouting the route in the rain, we weren’t too sure about how dry it would be in the morning, but the rain stopped in the early evening, and a stiff breeze helped dry the cliff. That said, there were still some very impressive wet streaks on the route, which made things a bit sketchy, when we arrived at 8AM the next morning. Also sketchy was the relative lack of good protection for the leader. 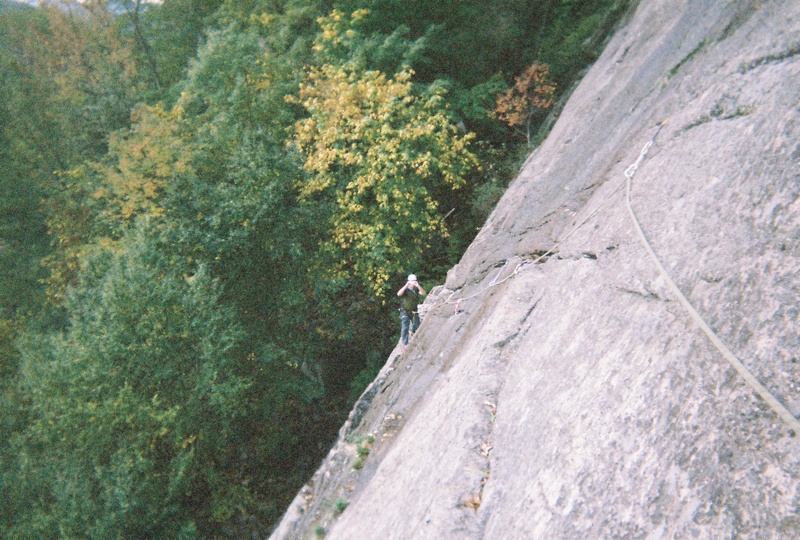 As climbers from the Southeast, we judge rock by how it compares to Seneca Rocks; in other words, we’re used to vertical cracks with incredibly scary exposure, steep/slightly overhanging routes, weird (but generally positive) gear placements, LOTS of loose rock waiting to rain down on you, and sandstone. 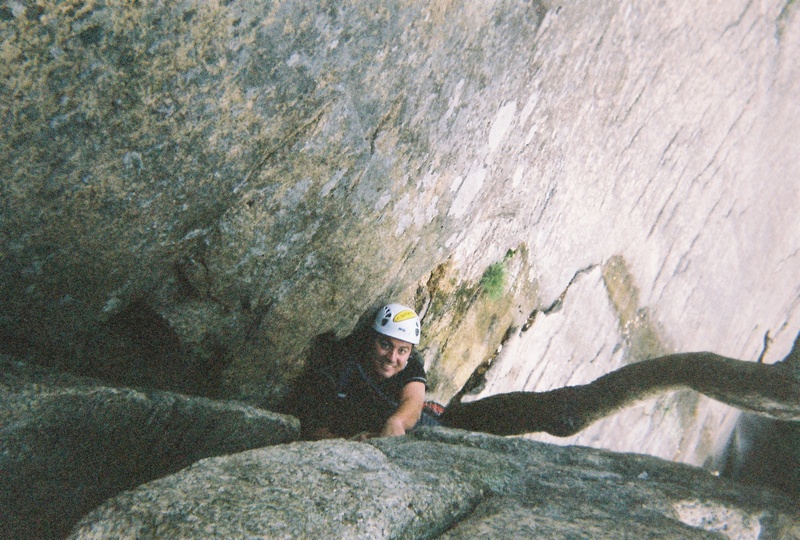 Here, we had largely slightly low angle, granite face climbing. The second pitch was the hairiest. I’ve never been so sketched on 5.6 terrain, and it wasn’t even vertical! It was a traverse! The rock was soaked, with water running down the face, which made every hold a slippery adventure. Normally, I wouldn’t have had any problem with it. But the wet holds made us both feel very insecure. We made it to the top of the third pitch; when we looked up at the fourth and fifth pitches, we realized that in order to climb them we would have to continue straight up a large, very wet, water streak. 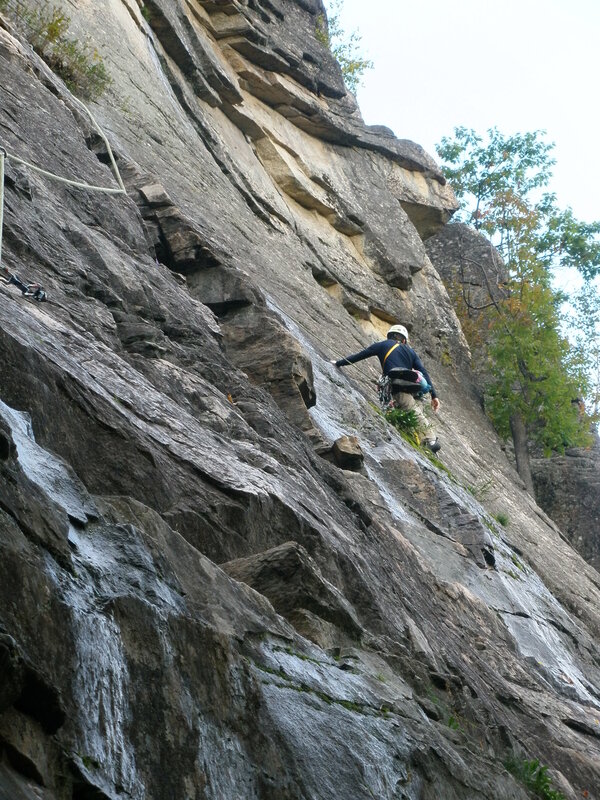 We decided that while this route would be well within our abilities if dry, the route was too wet for safety, especially with the thin protection. We decided to bail. We also spent some time top roping a neighboring route, a 5.8 called Thinner. It was tall–we needed every inch of our 60m rope–and followed a right facing corner. 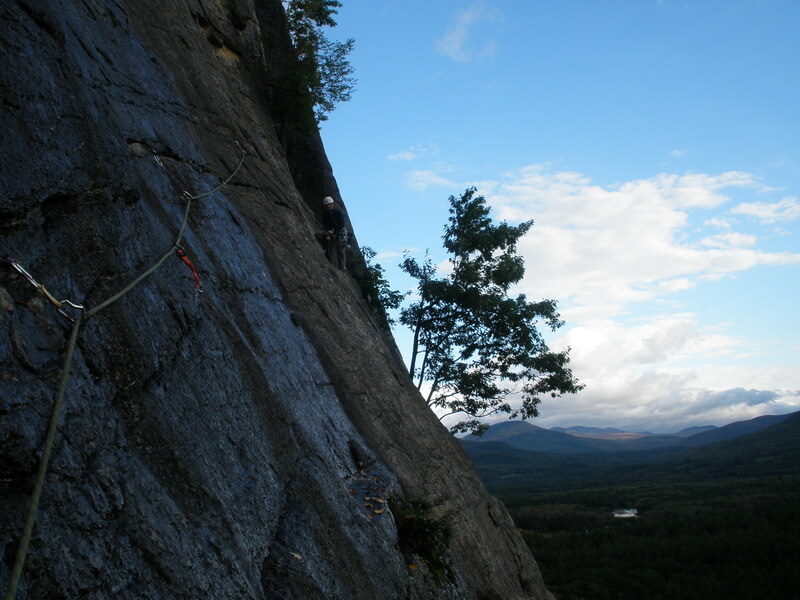 The route was delicate, technical, and required a lot of thought, but was not strenuous; everything I enjoy in a route. 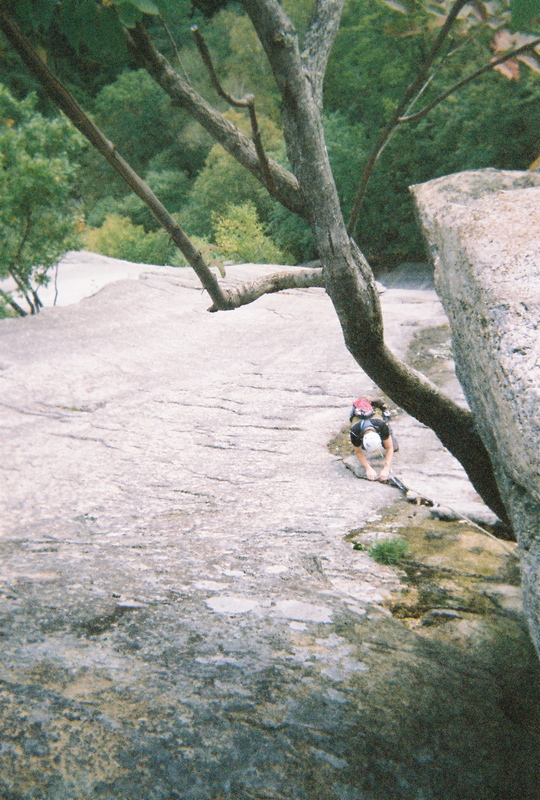 We found that while the holds were small, there were always options, and the fact that the climb was slightly less than vertical meant we were not hanging on our arms but could enjoy the small edges and friction holds. 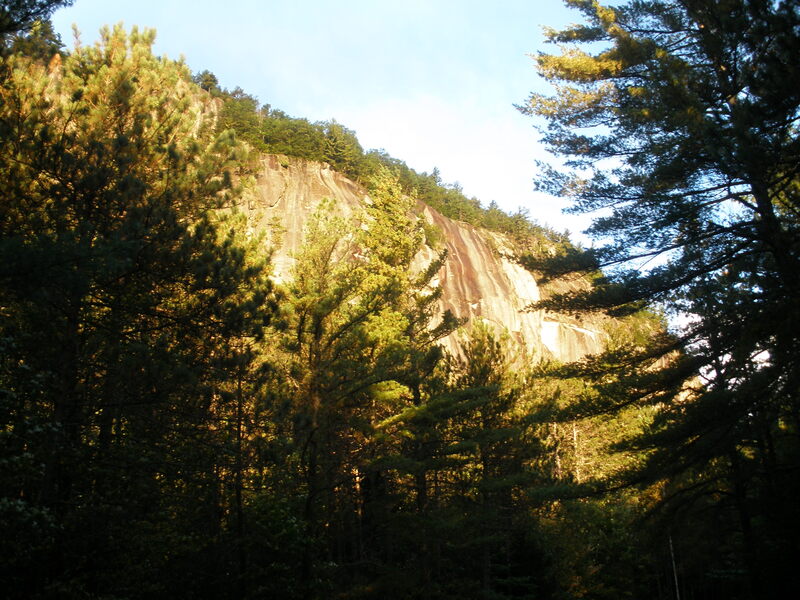 Basically, I found I love climbing on granite! I’ve included some photos of the day below. A (not so great) photo of Cathedral Ledges. 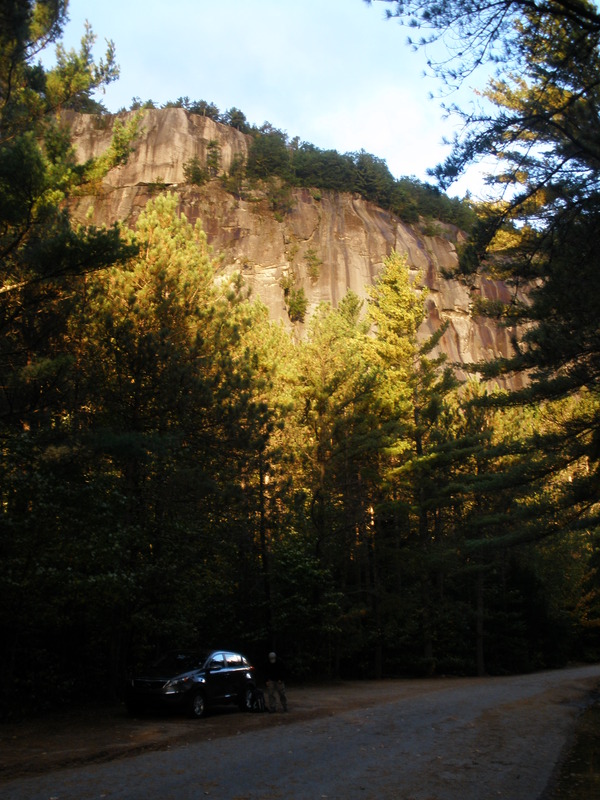 View of Cathedral Ledges from the parking lot. Another view. The dark streaks are from water. That's our rental car in the foreground; snazzy! Dad's all dressed up and ready to go. Little did he know how sketchy the protection above was! First pitch done, well into the second. This is the second pitch. See the water? Belay stances were good. The first, second, and most of the third pitches were fairly low angle too. 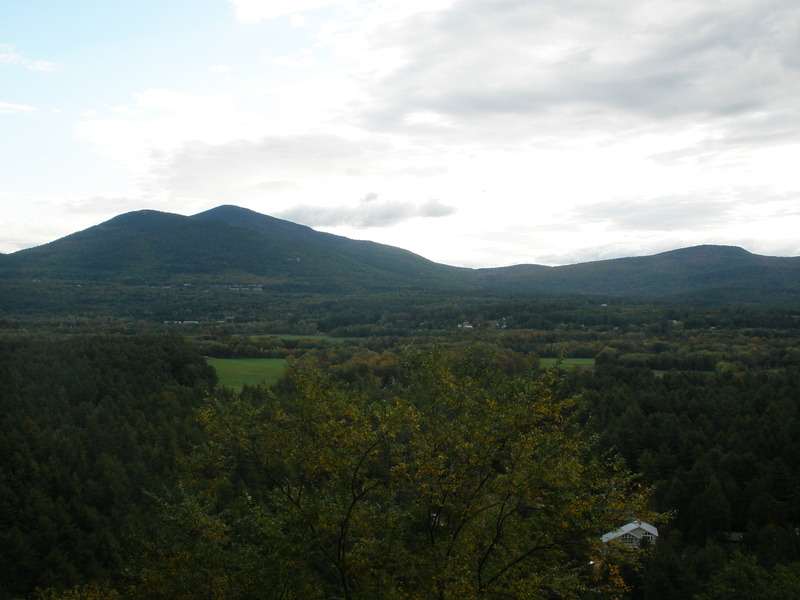 View of the Valley. Mt. Washington would be far to the left of the picture, but we could not see it from where we were. Can't go any higher. Might as well take a group picture.